The viola came into existence during the 16th Century. It was first called the “alto-tenor violin” because the term viola used to refer to any Western classical string instrument with a bow. 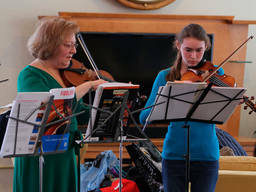 New Zealand is home to some of the many internationally-recognised viola players, including Gillian Ansell and Rolf Gjelsten. Can your kids live up to New Zealand's rich viola history and international violists? These young viola players are impressive! Is viola right for your kids? The viola is slightly larger and emits a deeper sound than the fiddle or violin. It is a stringed instrument, and you may find it in string quartets, string orchestras, and symphony orchestras. Playing a musical instrument is promoted by parents, teachers, and even doctors and psychologists as great music therapy for kids. According to experts, playing a musical instrument provides a form of expression that stimulates physical, emotional, mental, social, aesthetic, and spiritual health. Guitar is another popular kids activity, and playing viola may offer a great alternative to kids who want a greater challenge. Browse ActiveActivities directory today to learn more about viola lessons and registered music schools. Get your kids to start playing viola! Are you exploring activities for kids that do not post any safety risks? Are you a music enthusiast who wants to share your passion with your young ones? Viola for kids is a great way to immerse your children in classical music. Toddlers are welcome to join music schools, and there shouldn’t be any restrictions for instruments like the viola. If you already know the basics of viola, you can jumpstart your kids’ music education by spending conducting lessons with them and supervising their practice. Think about some nursery rhymes or children’s music they might like to learn. Make viola learning fun for your kids! Check out the ActiveActivities directory to see a list of music schools that offer viola lessons. Who knows, one day your child may be eligible to join the New Zealand String Quartet, and rub elbows with the likes of Gillian Ansell and Rolf Gjelsten!